There are pros and cons of home equity conversion mortgage. 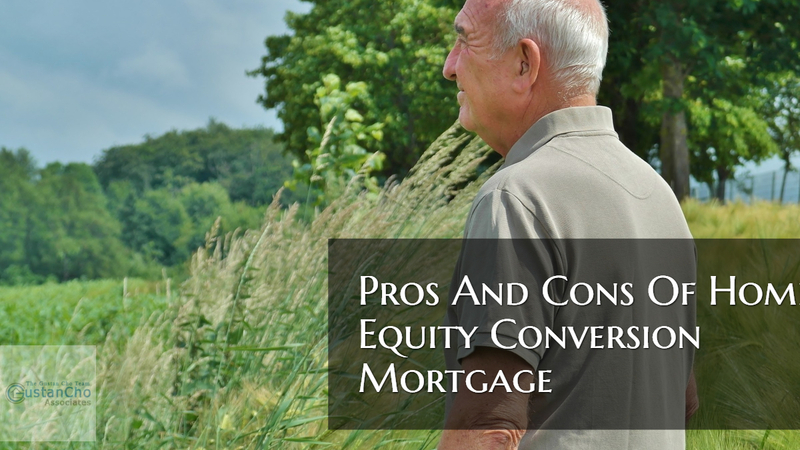 What is the pros and cons of Home Equity Conversion Mortgage? What Is The Difference Between Traditional FHA Mortgage vs. HECM Reverse Mortgages? Both types of mortgages require borrower pay property taxes and homeowner’s insurance maintain the home and comply with all terms of the loan. Michael Gracz of Gustan Cho Associates explains the pros and cons of Home Equity Conversion Mortgage, also known as HECM. So what are the benefits of an HECM Reverse Mortgage? In addition, heirs inherit any remaining equity after the reverse mortgage is paid in full. What are the pros and cons of Home Equity Conversion Mortgage? Michael Gracz now explains the cons. What are drawbacks of an HECM Reverse Mortgage is asked by not just borrowers of Mike Gracz, but it is a question that is asked my many real estate and mortgage professionals. Reverse Mortgage Borrowers have a choice of how they will receive their loan disbursements. Requirements of an HECM Reverse Mortgage. The HECM Reverse Mortgage Application Process. Mike Gracz of Gustan Cho Associates addresses that the Reverse Mortgage application process is similar to the traditional mortgage loan process and will typically take up to 60 days to complete. Michael Gracz is contributing associate editor and writer for Gustan Cho Associates and its affiliates and partners. Besides being one of the most knowledgeable Reverse Mortgage Loan Officers in national lending network. Michael Gracz is an expert in originating and funding FHA, VA, USDA, Conventional, FHA 203k, Jumbo, and portfolio loans. Please contact Gustan Cho Associates at 262-716-8151 or text for faster response. Borrowers can email us at gcho@gustancho.com. The Team at Gustan Cho Associates s available 7 days a week, evenings, weekends, and holidays. Gustan Cho Associates, the national consumer direct division of Loan Cabin Inc. NMLS 1657322 is licensed in multiple states. Gustan Cho Associates at Loan Cabin Inc. has a national reputation for closing loans in 21 days and not having overlays.